In the late 1970s, DC was doing poorly. Marvel ruled the roost, and DC publisher Jenette Kahn’s first attempt to fight back, through flooding the market with more titles with more pages, had imploded spectacularly. An increased corporate attitude at Marvel, however, tempted over some key talent, including Marv Wolfman. Together with friend and editor Len Wein, he decided to revive the Teen Titans, a group of superhero sidekicks who in their previous incarnation had been best known for the sheer absurdity of their stories. 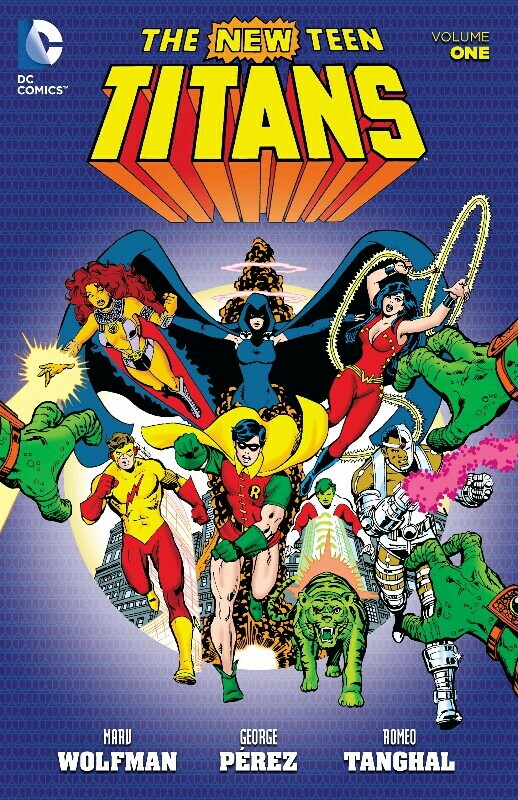 Wolfman kept founders Robin, Kid Flash and Wonder Girl, dumped Aqualad and everyone who had joined the Titans after the team’s first appearance, and added four new members. Changeling as Beast Boy had been in the Doom Patrol, but Starfire, Raven and Cyborg were wholly new characters. To draw this series, Wolfman teamed with George Pérez, who had come over to DC for Justice League of America. Setting the series in New York, where most Marvel comics took place, rather than a more typical DC fictional city, makes obvious Wein and Wolfman’s plan, which was to produce a Marvel-style comic in the DC Universe. To this end they included a number of story elements more familiar at Marvel, such as a fractious group dynamic built around younger characters, who could be identified with by a teenage readership, or a fight with other heroes, in this case the Justice League of America. The intention was to produce something that could rival X-Men by seizing on what worked best in that title. 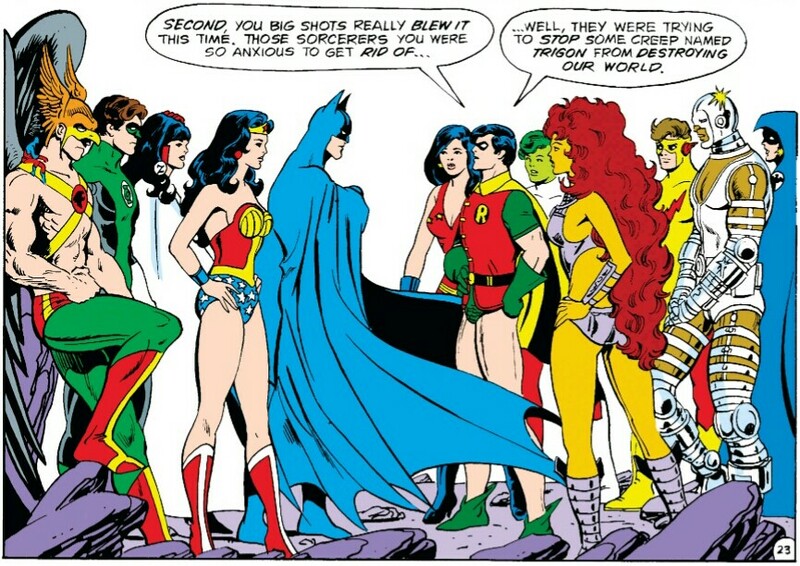 New Teen Titans had a slightly rocky start, as Wolfman describes in an introduction. Presumably readers expecting something like the previous Teen Titans were confused by what they actually got, but only a few issues in sales suddenly started to soar. It’s not hard to see why. Essentially, the Marvel formula worked at DC. Wolfman’s later Marvel work had been uninspired, but the new series seems to have reinvigorated him. True, he overwrites dialogue in the early issues, something that tends to be encouraged by producing comics Marvel-style (i.e. the artist creating pages from a synopsis, to which the writer then adds words, rather than the artist working from a full script). But by the last of the comics reprinted here, which cover 1980 to 1981, he was reining himself in. The character dynamics worked, and both new and old characters are interesting to readers. With sympathetic inker Romeo Tanghal, Pérez also took to the series with enthusiasm. Where on Avengers he had generally only drawn small batches of issues, for Teen Titans he was able to produce longer runs. Fill-ins weren’t unknown – there is one here from Curt Swan – but they would be much rarer than before. Pérez clearly has fun designing the new characters. Cyborg is the sort of intricately designed figure that Pérez delights in, whilst in Raven, with her slimmer build and body-enveloping cloak, he designed a superheroine in marked contrast to the scantily-clad pneumatic heroines usually found in comics, of which Starfire is the epitome. Most of all, Pérez seems to have fully taken to the role of co-plotter, and the series benefits enormously. These comics are good quality, but Teen Titans would improve. 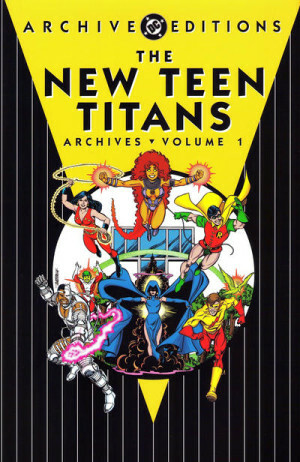 This originally appeared as New Teen Titans Archives 1, and was then republished with the same comics as New Teen Titans 1.